Croton angularis Klotzsch ex Baill. Photograph by: Flora Brasiliensis Illustration. 1840-1906. Vol. VIII, Part II, Plate 70. 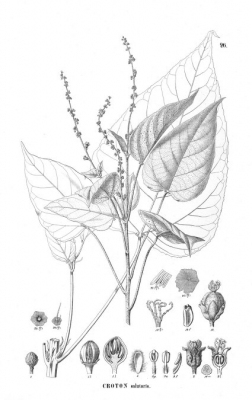 Detailed information on the medicinal uses of more than two hundred rainforest plants, mainly from S. America, with basic descriptions of the plants, their other uses etc. The sap is a popular and effective herbal treatment, and so it is commonly harvested from the wild for both local use and for trade. S. America - southeastern Brazil. Mors W.B. ; Rizzini C.T. ; Pereira N.A. An extremely concise book, listing approximately 1,500 species and varieties of plants with their botanical name, common name in Brazil, regions in Brazil where the plant is found, a brief list of uses and any medically active compounds in the plant.